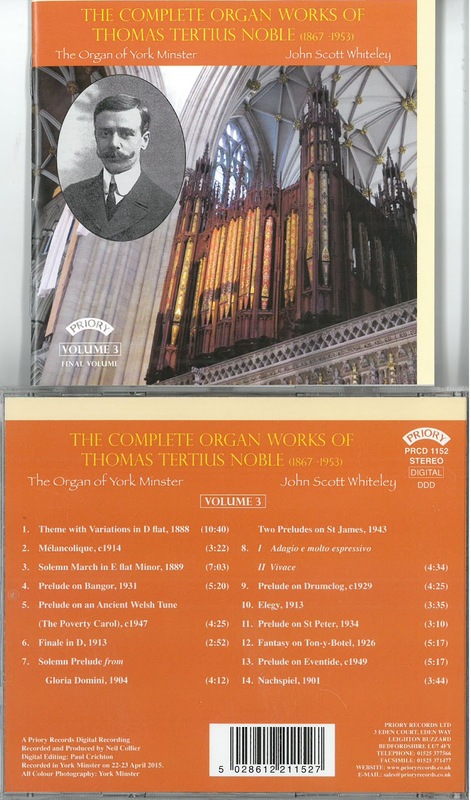 Among those composers who are remembered today just for one single work is Thomas Tertius Noble, former organist of both York Minster and St Thomas’s Fifth Avenue New York. Those with an interest in English church music know of Noble in B minor, one of the classic settings of the Evening Canticles, but few know of anything else; except, perhaps, a handful of hymn tunes and psalm chants whose authorship usually passes unnoticed. John Scott Whiteley describes Noble as “one of the last of the great Victorian cathedral organists”, and clearly thinks highly enough of Noble’s work to record his complete organ works for Priory. This is the third and final volume. As Whiteley points out in his extensive and extremely detailed booklet notes, Noble was very much a musical chameleon, “latching onto whichever currents of influence found their way into his life”. Certainly the 15 pieces on this disc show no common stylistic thread, and while they are all utterly typical of English organ music of the era, they lack any kind of distinctive voice. Add to that a sense that the craft of composition concerns Noble more than its results - as the late Arthur Wills so memorably put it in his published guide to the organ, referring to Noble’s French conytemrpaories, “the craftsmanship of their work is never in question, but the musical content is frwquently too arid to interest musicians outside the organ world” – and we have rather a lot of well written but ultimately unmemorable pieces here. Possibly because it comes from a much larger work – a canatat written for York Minsuter in 1904 – the The prepondarnce of hymn tune preludes on the disc point to the practicality of Noble’s organ music, although it remains an intriguing puzzle as to why so many of them on this disc are based on Welsh melodies. They generally tend to be soft and harmless, their structure governed by the tune itself, which mercifully means that their rambling nature does not let any of them go on too long. Another aspect of Noble’s life which prompted him to write organ music, was his prolific recital-giving, and for a major recital tour of the USA in 1913 he composed his Finale in D. While Whiteley suggest that in it Noble is paying lip-service to Vierne’s famous Finale has neither the melodic interest nor the general mood of excitement of his Parisian counterpart.